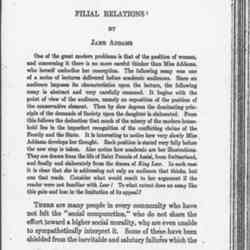 Subject is exactly "Addams, Jane, writings, Democracy and Social Ethics"
A selection from Addams' book Democracy and Social Ethics, "Filial Relations" addresses ideas of women being able to live full lives and have thoughts outside of family life. 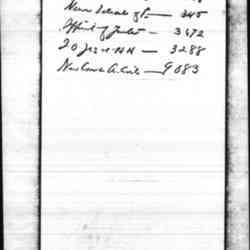 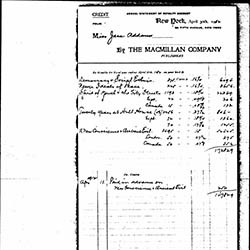 A royalty statement from the Macmillan Company to Addams for sales on five of her books. 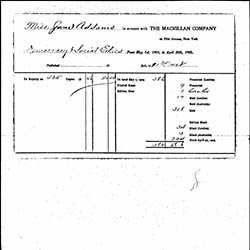 A royalty statement for all of Addams' books. 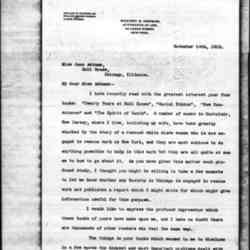 Morgan praises Addams for her books, four of which he has recently read, and discusses the impact they have had on him. 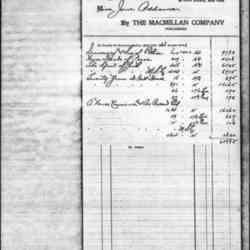 The Macmillan Company's annual statement of royalties on Addams' books. 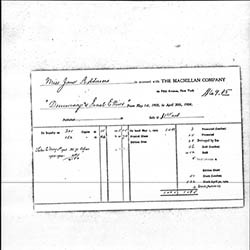 Macmillan Company statement of royalties for Addams' first four books. 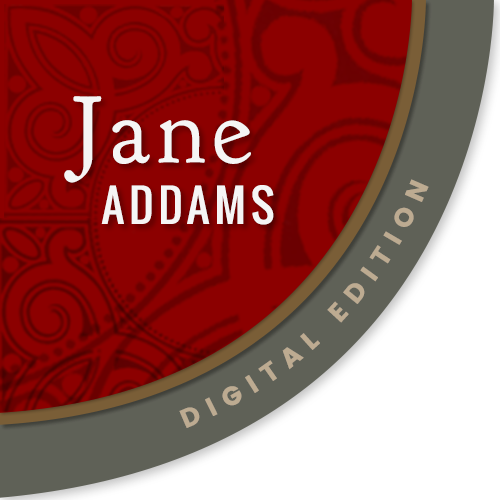 Fremont Older writes a letter to Jane Addams about her book, Democracy and Social Ethics, and how it relates to the current situation in San Francisco. 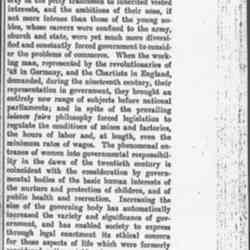 Stebbins writes Addams in praise of Democracy and Social Ethics. 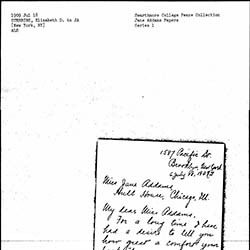 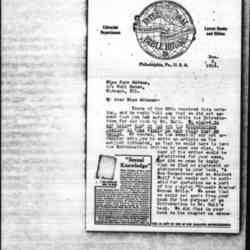 Addams writes Marsh to negotiate the title of her upcoming book and the payments of her publishing contract. 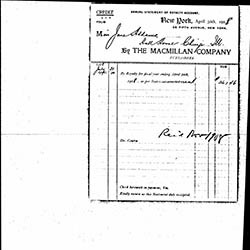 Macmillan Company sends Addams royalty statements for her books. 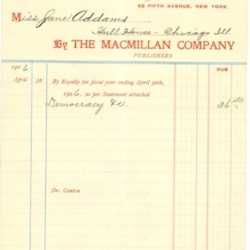 Macmillan summarizes royalties earned by Addams' books between April 1907 and April 1908. 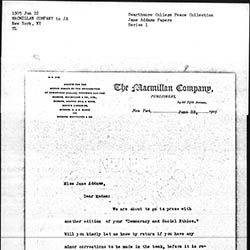 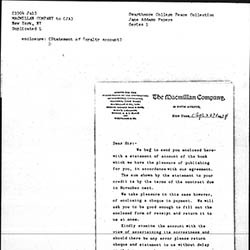 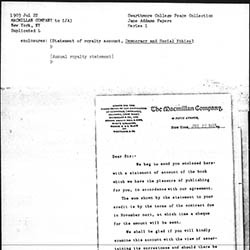 These statements detail the financial compensations Addams will receive from Macmillan Company for the publication of Democracy and Social Ethics and Newer Ideals of Peace. 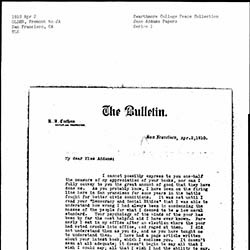 Baker writes Addams to praise her work in both Newer Ideals of Peace and Democracy and Social Ethics. 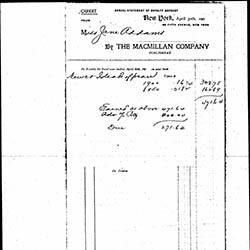 Macmillan sends Addams a royalty statement. 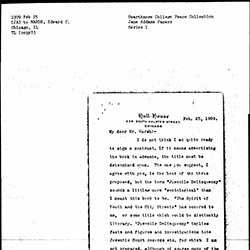 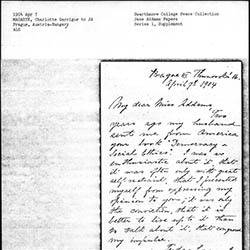 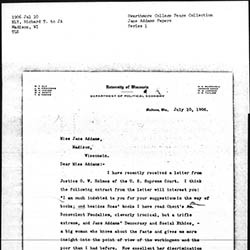 Ely forwards Addams part of a letter from Justice O. W. Holmes of the U. S. Supreme Court, expressing how much he liked Addam's book Democracy and Social Ethics. 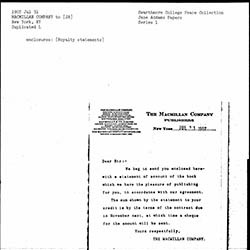 Macmillan encloses a statement on sales of Democracy and Social Ethics. 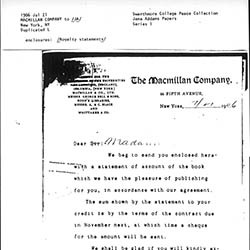 Macmillan asks Addams to provide corrections to Democracy and Social Ethics before it is reprinted. 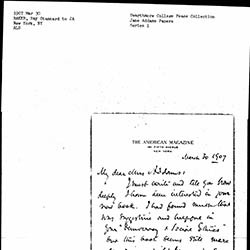 Addams writes Smith about a donation, and recent news. 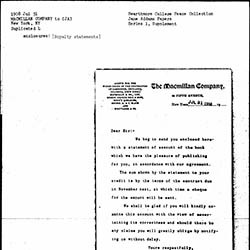 Macmillan sends Addams a royalty check for Democracy and Social Ethics. 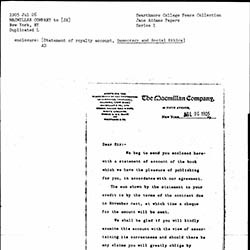 A royalty statement for sales of Democracy and Social Ethics. 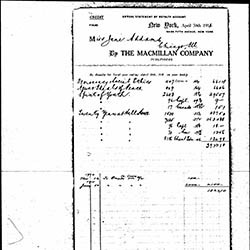 Royalty figures for Democracy and Social Ethics, 1903-1940 sales. 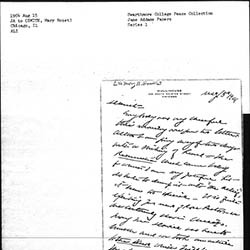 Masaryk writes enthusiastically about Democracy and Social Ethics, and asks Addams to assist her "Slavic girl" Alice who is in Chicago with Miss McDowell.